A mortgage loan ranks among one of the oldest bank products. Nowadays it represents a rapidly developing branch of bank lending operations. It is usually characterized by either capital project financing (like for an individual purchasing a house) or the issue and sale of mortgage bonds by institutional investors in capital markets. In 2008, problems with mortgages contributed to the financial crisis. Since then, mortgage markets in Europe remained fragmented. This can already be seen in the different mortgage interest rates across the continent. For example, the mortgage interest rate in Italy reached a value of 2.33 percent in 2016, whilst Hungary had a considerably higher interest rate of 4.89 percent. In short, each European country has its own dynamics when it comes to mortgage finance. 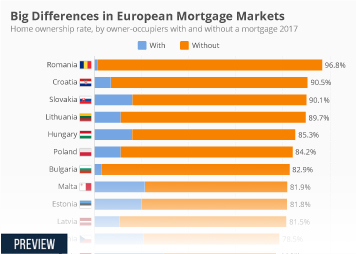 The size and importance of mortgage lending in European countries varies significantly as there are many differences when it comes to taxation, rules for consumer protection and different ways of providing mortgage loans. Countries such as Ireland, Portugal and Spain have tried to deregulate their total outstanding residential lending, whilst the volume of mortgage activities increased significantly in countries such as Belgium, France and Sweden. In the first quarter of 2016, the total outstanding residential mortgage lending in Germany, for example, amounted to approximately 1.284 billion euros. Only the United Kingdom reached a higher value than Germany. The mortgage market in Denmark, however, stagnated somewhat. Most countries in Europe show increasing housing prices, which means an active market based on improving economic conditions throughout the EU coupled to tight supply and high demand. For example, between the start of 2014 and the end of 2015, Romania and Portugal were among the countries which experienced an increase in housing prices, while the prices in Slovania and Italy decreased. This development is enhanced further by the monetary policy of the European Central Bank (ECB), as its policy of artificially low interest rates leads to cheap credit. Consequently, as interest rates decreased, mortgages with an initial rate fixation became more and more popular, for example in the Netherlands. A recent development is the use of crowdfunding to raise money. This involves investments in or lending of relatively small amounts of money by a large group of investors to private individuals or companies, and usually happens through an online platform. The market size of alternative financing methods in Europe reached a size of approximately 5.4 billion euros as of 2015. Crowdfunding a property through a peer-to-peer website is, as of yet, possible and could well play a decisive role in the European mortgage markets. Indeed, survey data in 2017 showed that approximately 53 percent of respondents, industry experts, expected a moderate increase in debt funding for real estate investments coming from alternative lending platforms at that time. More interesting topics from the industry "Mortgages & Financing"